I am lucky enough to live near a farm that sells fresh chickens. I'll never forget the first time I baked fresh chicken breasts. The flavor and texture of the meat was outstanding. From that time on there has been no more Perdue for us. This beautiful roasted whole chicken is based on Ina Garten's Perfect Roast Chicken Recipe. I'd suggest if you ever have a chance to purchase an organically raised farm fresh chicken you buy it. The flavor is definitely worth the extra money. Remove the chicken giblets, Rinse the chicken inside and out and remove any excess fat or pin feathers. Pat dry inside and out. Liberally salt and pepper the inside of the chicken. Stuff the cavity with the bunch of thyme and the lemons and all the garlic. Brush the outside of the chicken with butter and sprinkle outside with salt and pepper. Tie the legs together with kitchen string and tuck the wings under the bird. Place the onions, carrots, fennel, potatoes in the roasting pan. Toss with salt and pepper and olive oil. Add thyme sprigs. Place chicken on top. 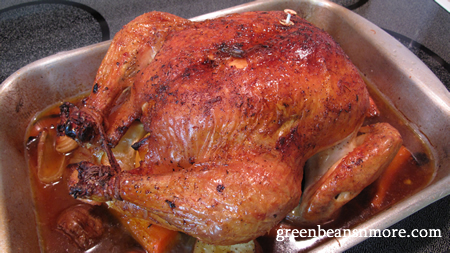 Roast chicken for 1 1/2 hours (or until it reaches a minimum internal temperature of 165°F). The juices should run clear when you cut between the leg and the thigh. Remove the chicken and vegetables from the pan to a platter and cover with aluminum foil for 10 -15 minutes. Slice and serve with vegetables. Cooks Tips: I add more or less vegetables. My husband really enjoys carrots and onions cooked this way, so I generally add more than called for the the original recipe. The original recipe doesn't call for potatoes but I add them and make this a one pan meal. I also add water or chicken stock so I can make a gravy. My chicken weighed-in at a healthy 7 pounds and cooked for 1 hour 45 minutes. As you can see I had the added benefit of a pop up timer. See instructions for how to place a thermometer in poultry below. In order to keep potential contamination down to a minimum I try to work with the chicken in a planned way. First I get all the veggies ready and in the pan. I get the lemon, garlic and herbs to be put in the cavity ready. I have the butter melted and ready to use. I cut the kitchen string to the desired length. I put about 2 tablespoons of kosher salt and 1 tablespoon of pepper plus any dry herbs I may be using on a paper plate (so I'm not dipping dirty hands back into the salt keeper, etc). I then wash and dry the chicken and start prepping it.